Awhile back I wrote about my experience learning to touch type. While writing it, I found this related article by Sacha Chua, which helped me rationalize to myself why it is such an important skill to learn. I ended up spending almost an hour browsing Sacha's site. The amount of resources, posts, tips and tutorials that she shares is humongous! Now, it's not that I wouldn't have landed on her blog at some point. Few days earlier, I had started my Emacs adventure. As it turned out, Sacha writes alot about Emacs, and is super involved in the Emacs community. So now I had two reasons to listen to what she has to say. Yet, that wasn't all. Both touch-typing and Emacs were only means to an end, that end being writing. I wanted to write better and blog more often. 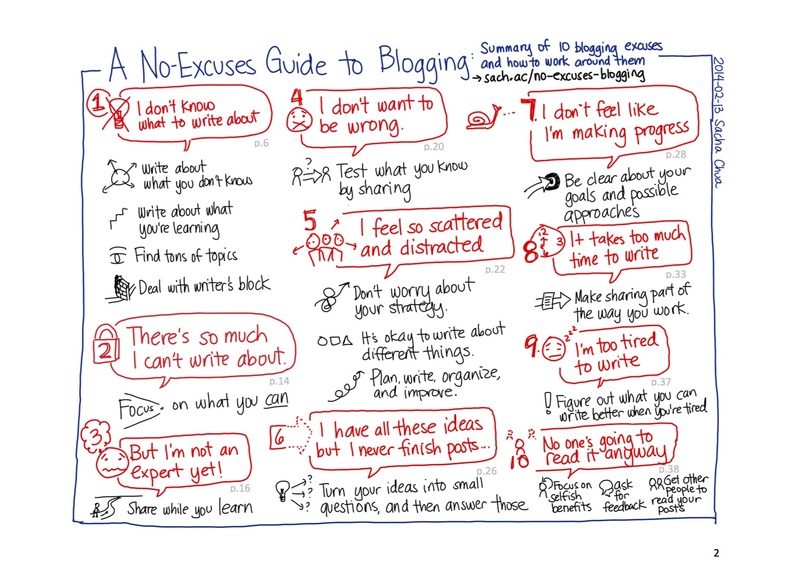 And so, when I landed on Sacha's "No Excuses For Blogging" ebook, I was intrigued. Not only that Sacha articulates the excuses that stopped me from writing so accurately, but the tips and tricks to overcome those excuses are dead simple and easy to follow. You don't know where to start a post? write it as an answer to an email. You want to write about something, but not sure you know enough? write about what you don't know, and document the way you go about learning it. Can't decide what you should write about? don't decide; just write about whatever you're doing or learning. Focus will come in time, and by that time you're already a blogger. And Sacha's site is a perfect implementation of her own tips and tricks. It feels like her blog mirroring what goes inside her head, and that's exactly how I wanted my writing to be - fully synced with my thoughts. I create an entry for everything I want to learn, explore or do1. Not only that it creates an endless pool of ideas, but it also keeps me focused, by forcing me to document the path of exploration. I keep those entries in one org file, called posts_drafts. My goal is to develop each of those entries to a blog post. This draft file is public. Here it is. "There's much I can't write about"
git commit -a -m "[post content]"
I use Sacha's tip to phrase my posts as an answer to a question, or an email. Usually, the question, and the subject of the entry I put in the draft file is the search term I google. This habit helps me stay focused on the subject and the point I'm trying to make. "I feel scattered and distracted"
I don't try to create a theme for my blog. Instead, I try to write and post as much as possible. No one is going to read my blog post by post, and so there is no reason to think of it like a list of sequential posts. This short book helped me more than many of the books I read about writing in general, and blogging in particular. It also inspired me to start a Blog Writing meetup, and circle myself with people who write for their living. So, if you're looking for ways to overcome your blogging procrastination, or just get some pithy writing tips, do yourself a favor, and make sure to read that book.